North Antrim musician Colin Henry was brought up on the late night music sessions in his family hotel. Not the familiar trad or bluegrass sessions, however, but around the piano - playing and singing swing, jazz, show tunes and the occasional Irish ballad. His first performance at the age of 15 was playing ‘Down by the Riverside’ on tenor banjo. He has been playing and performing ever since. His musical epiphany came when he discovered the resonator guitar or ‘Dobro’ as it is popularly known. 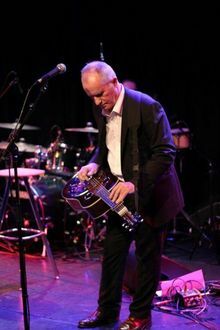 Colin now concentrates on the resonator guitar almost exclusively, and has become one of the few musicians in Northern Ireland to have mastered the instrument to a high standard.